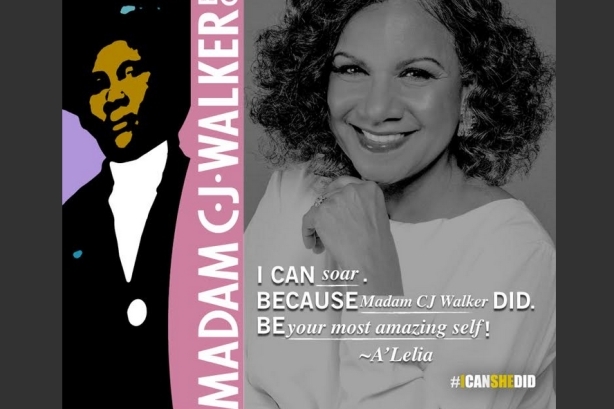 Sundial is paying homage to Walker, America's first female self-made millionaire, by raising awareness of her life and legacy with its #ICanSheDid campaign. Beauty and personal care product company Sundial Brands has set out to empower women with a campaign dedicated to America’s first female self-made millionaire, Madam C.J. Walker. Starting with her homemade hair products in the early 1900s, Walker, an African-American, built a business that propelled her to success. The digital component of the campaign is called #ICanSheDid, and includes an online meme generator that invites women to celebrate their individual accomplishments, as well as the women who have inspired them, through photo uploads and social sharing. In March, Sundial celebrated the launch of the Madam C.J. Walker Beauty Culture line exclusively in Sephora and Sephora.com. The collection was built to honor Walker’s legacy. The campaign team at Sundial began planning for the campaign back in May 2016. Latraviette Smith, SVP of communications at Sundial Brands, explained that the company wanted to pay homage to Walker by raising awareness of her life and legacy. Additionally, Sundial wanted to demonstrate to women that the values and ideals Walker held, which also contributed to her success, are timeless. "We want women to know that whatever their challenges, they can create the life they desire because there have been dynamic women throughout the course of history who have shown us that it can be done," said Smith. The PR team sought to ensure that the campaign broke through the clutter with an engaging program that would resonate with women and encourage social sharing, thus the online meme generator idea was born. The campaign would also include a series of video vignettes showcasing entrepreneurial women and influencers who represent Walker’s attributes. The team looked to tap a variety of different female social influencers who would be able to share the campaign across a broad range of social channels. In addition, Sundial developed a branded website, www.ICanSheDid.com, to accompany the campaign. In late June, the campaign kicked off with an evening event in Harlem for approximately 250 community influencers. Sundial debuted the trailer for the video vignettes over cocktails and hors d’oeuvres. A photo booth was also present at the event, allowing women attendees to create and upload their own meme. In addition, the campaign team gave out samples and curated a "Beauty Culture" corner featuring the entire Madam C.J. Walker Beauty Culture collection. The campaign team also developed an #ICanSheDid activation at the Essence Festival, a music event put on by Essence magazine in New Orleans July 1-3. The activation featured product sampling, brand education, giveaways, and book signings with A’Lelia Bundles – the great-great-granddaughter of Walker. Through the online meme generator and subsequent social sharing, women were encouraged to complete the phrase: "I can ____. Because ____ did. Be ____." "Social media is critical for the brand as we embrace it as a critical direct connection to our community and utilize it to engage in consistent conversation with them regarding both their beauty needs and other aspirations," said Smith. For this effort in particular, the custom-branded memes were primarily shared via social media, and Sundial’s social platforms were used to highlight the video vignettes as they were released. The #ICanSheDid campaign includes 20 short films showcasing entrepreneurial female influencers who represent the ideals of Madam C.J. Walker Beauty Culture. Some of the influencers include: style and media personality Tai Beauchamp, wellness entrepreneur Latham Thomas, the editor-in-chief of Heart & Soul magazine Anita Kopacz, and recording artist Renee Neufville. Upcoming elements include a pop-up event in New York City, New York Fashion Week activities, digital banner activations, and several contests. The campaign has been covered by publications including Allure, Yahoo Beauty, MadameNoire, Essence, Women’s Wear Daily, Heart & Soul, and Hype Hair. Thus far, coverage featuring the campaign has generated an online media readership of more than 6.7 million. Sundial's branded social channels saw a 40% increase in traffic for the four weeks following the campaign launch.